What Happens When You Throw A Boomerang? It Comes Straight Back To You, Of Course! You Send Out The Software And BOOM, It Comes Back With A Mailing List! Sure, if you are lucky enough to get thousands of visitors to your site each day you will generate a mailing list using the above method, but let's face it - in the real world we don't get thousands of visitors coming to our website each and every day, so we have to think outside the box. We have to use the methods that are not so well known, we have to take advantage of every possible situation to help us build a large, targted and most importantly a responsive mailing list. "This is going to be excellent for all those people wanting to increase their list"
I must congratulate you on your excellent Boomerang List Builder, I just tried it with a PDF eBook and an EXE eBook and it works a treat! It took me about 60 seconds to create and I did not even have to look at the step-by-step guide you included! This is going to be excellent for all those people wanting to increase their list, and even better, it gives a list targetted with the product that you use it on! I think I will be using this on all my products from now on! Thanks for introducing Boomerang List Builder to me Dan. "Got a golf ebook? Wrap it in BLB and you start your golf niche list"
Dan, I have always been a fan of your work - your original and innovative ideas never fail to astound me. I really think you've surpassed yourself with this one, though! You don't seem to have left anything out, what a great piece of software. Anyone wanting to build a list from scratch, or indeed add to their subscribers, will be absolutely delighted with the results that Boomerang produces. And it's so easy to use. Got a golf ebook? Wrap it in BLB and you start your golf niche list. Got a cookery ebook? Wrap it in BLB and you've got a recipes niche subscriber list. Need I go on? The possibilities are endless. This is going to be huge, Dan, and I'm delighted for you. Great stuff! I have been building my mailing list using "outside the box" ideas since early 2007, this has helped me build a number of large mailing lists on a number of different subjects. These ideas are not rocket science and they most likely won't involve any extra work from you. How can I make such a bold statement like that? Well it's easy, I'd bet good money that anyone reading this page now has either sold something online in the past, given something away, promoted someone elses product, sold an item on eBay, written an article, made a blog post, posted on a forum, the list goes on. My point is that you are probably missing a massive opportunity by not looking at things from a different angle! These things that you do everyday is an opportunity to build a relationship that has the potential to last a lifetime. You will kick yourself for not doing this sooner, you will be amazed at how simple, yet effective my secret weapon really is. Simple 1 Minute Set Up Process! Yes, I know it sounds fantastic, and I really believe it is. But as I created it - I would think that, wouldn't I? "It's so simple in it's concept, so simple to use and I found it to be immediately effective." Dan kindly gave me the opportunity of testing his Boomerang List Builder software - and I'm so pleased he did. It's so simple in it's concept, so simple to use and I found it to be immediately effective. single article to Ezinearticles.com. I quickly gained 14 new subscribers to my mailing list all of which are verified and non are "pending." Dan - I'm convinced you're on to a winner with the Boomerang List Builder. I look forward to pushing forward with the promotion of Page Rank Paranoia and gaining many, many new subscribers to my mailing list because of it. "Had another 3 sign ups since last night which is great! I have had more sign ups in the last 2 weeks than I have had when I did this on my own for the last 4 months!!!!" I am totally amazed at the difference this fantastic software has made to my list. Sign ups are coming in thick and fast daily whereas before Boomerang it was a slight trickle of new subscribers here and there. Another huge plus is how EASY it is to set up. Dan has included step by step, clear instructions. It literally takes minutes to be up and running. This is perfect for you, whatever your level of technical knowledge is! I love it! Many thanks! "Boomerang List Builder make it a simple process to gain willing members to anyone's list"
I am a complete newby when it comes to some of the new techniques that abound on the Web nowadays. At times, even the thought of using new software can baffle me some. My learning curve often goes straight up. But, this new software Dan just created is so easy to use that I feel confident and safe enough to use it. His screenshots and step-by-step explanations on how to use Boomerang List Builder make it a simple process to gain willing members to anyone's list. I'm actually going to use it myself! I fully recommend this new jewel from Dan Thompson's fertile brain if you want to increase the size of your list considerably. You will love it! If you've heard enough and just want to order now, please do. I first got the idea for the software when I purchased a software package that asked me to validate my purchase by entering my email address into a form, I thought nothing of it at the time until I started to receive follow up emails from the person - then I realized that I had actually subscribed to his list. As I was writing my own eBooks at the time I suddenly saw huge potential, I could build a list of targeted subscribers for each different item that I sold, by asking them for an email address to register and validate their purchase or claim of my free gift. Within no time I had built up a number of different targetted lists, however the method I was using wasn't user friendly and sometimes it actually annoyed the user of the product, which for me was a big worry - if my customers weren't happy then neither was I.
I had to make the process much more user friendly, so I decided to design the Boomerang List Builder software. When I was designing the software my main aim was to make the sign up process as simple as possible for the user. Then the next step was to make it as simple as possible for you to use! That even involved giving a copy to a friend with NO Techy knowledge whatsoever, and to be fair - he got stuck on the first page of instructions. The development continued until he found it easy and simple to use. After all the extra research, development and of course testing, I was able to use the Boomerang List Builder (my new version) on a new eBook of mine - Basic CSS. "I think you're on to a winner with this one Dan - there are so many possiblities for people with no lists"
Thanx for letting me test your Boomerang Software. But I must say with your new instruction pdf and the revisions you've made - it was too easy. I love the steps 1 - 9 with the examples! So yeah - I can honestly say even I was able to get the whole process done in less than ten minutes. I think you're on to a winner with this one Dan - there are so many possiblities for people with no lists to really get themselves going with boomerang... let me know when you release it. "The next day I was shocked to discover I had generated 254 subscribers"
This software is so easy and so effective it's scary. I remember using your software on one of my eBooks and offered it as a gift in my newsletter. The next day I was shocked to discover I had generated 254 subscribers. 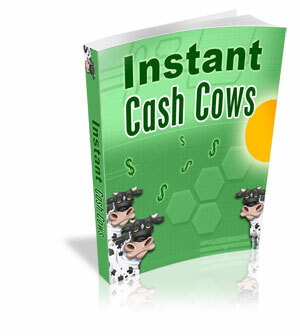 I know anyone that distributes free reports and eBooks needs this software. A targeted responsive list is hard to find, but you my friend have cracked it. I released this product with full resale rights and then started to distribute it on eBay and free giveaway forums and sites. Remember that each time a new customer opens the book they have to give me their email address before they can view it. That means that as more and more people sell the book (as it comes with resale rights) the more and more people I get on my list! Think about how it could virally spread and build your list for you, just as it did for me. Let me demonstrate this to you with a rather badly drawn diagram! You can see that you would be at the top of the pyramid with 1 book, then as each person who received yours starts to distribute the book which in turn gets passed on and distributed by someone else, who then passes it on to another reseller and so on. So before you know it your book is out there in cyber space being downloaded by everyman and his dog (I'm from Yorkshire, couldn't miss the chance to slip it in! ), and the best thing about it all, each person in the chain had to give me their email address before they can view the product! If you would like to see a live demo of the Boomerang List Builder in action from a customers perspective please download my Basic CSS eBook below. Please Download My "Basic CSS" eBook Free Of Charge! This eBook has been wrapped using my Boomerang List Builder software. Each time a new customer runs the book for the first time, they are then subscribed to my mailing list! 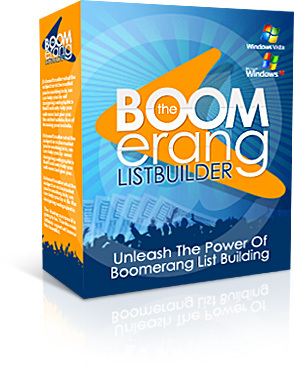 Are you starting to see the power of the Boomerang List Builder yet? You now know how easy it is from a customers point of view, but what about from your perspective. Let me show you how easy is it to wrap one of your products with the Boomerang List Builder software! Select the file you wish to lock and click on "Next"
Give your item a name and click on "Next"
Select the "lock type" and click on "Next"
Enter the registration code and click on "Next"
Enter the URL of your opt-in form, click on "Next"
Choose a custom icon (optional), click on "Next"
Enter your affiliate link (optional), click on "Next"
Enter your terms of service (optional), click on "Next"
Save your locked file - Done! And you can thank my Non-techy friend for making it this easy, He really does struggle with anything that involves any technical terms or actions, so they've all been taken out of the set up to make it this easy for you too! It really is as simple as that! The whole process takes less than 60 seconds and can be performed by anyone, even a total PC newbie. Everything is laid out in an easy to follow step by step wizard, all you have to do is enter the information and keep clicking on the "Next" button until you are done. watch the video below and see just how easy it is. Or go and place your order now. Let me demonstrate just how easy this software is to use. Click on the images below to launch the video. The box on your left is the High Res version and the box on your right is the Low Res version. Gain extra sign ups to your list from the viral storm you've helped create with it! So are you now ready to click on that buy now button and start reaping the rewards? provided by The Boomerang List Builder group. *Please click on the "Finalize Your Order" button after checkout to download the software. "It's a GREAT concept Dan...I belive your onto a winner with this!" I just bought a copy and WOW! It's a GREAT piece of software you have here! You even go into a bit of detail of how to setup the autoresponder and pages for the code. have boomeranged most of the PDFs on my desktop...it's just that easy! Thanks again Dan, and keep up the good work! Thank you if you've already decided to make your list building easier and simple from now on - but there is actually more built into the software, some 'icing on the cake' for you. We Haven't Scratched The Surface Of Extra Bonuses Built In To The Boomerang List Builder. Infact we are nowhere near uncovering all of the little "nuggets" that I love including in my products. I have told you about the basic principles behind the software but I'll be honest with you, I get just as excited about the little things that don't jump out on you at first, let me take you through even more great features of the software. Each time you wrap a product you are given the option to enter an "affiliate link". If you choose to enter your unique affiliate link (generated by clickbank) into this field you can earn commissions on auto-pilot each time someone unlocks your item! Unlock some solutions the Boomerang List Builder isn't limited to just wrapping PDF documents, the Boomerang List Builder can wrap anything from PDF's to WMV's! You can wrap ebooks, software, videos, basically anything you want to build your list with. The Boomerang List Builder will function with any mailing list provider, this includes 3rd party solutions such as Aweber and GetResponse. As well as your own custom hosted solution. You can use the Boomerang List Builder to create free trials of your products. You can either set the product to require a registration after x number of uses or x number of days! Your opt-in pages and forms are 100% customizable. You can either choose to use our default template (supplied with the software to make it even easier for you to set up) or you can use your own design for maximum personalization and coversions. The Boomerang List Builder offers you a number of different upsell opportunities. Once the user has subscribed to your list you can then follow up with further information and offers. You can also use the opt-in pages as gateways to other offers and services of interest. I'm sure by now you really do just want to get your hands on your own Boomerang and start building your list easier and quicker to take all your successes to new heights. Your download will include the simple instructions developed to get you using your Boomerang with minutes. What, you still want more? Go on then, as you asked nicely I'll thorw in some bonus items for you! 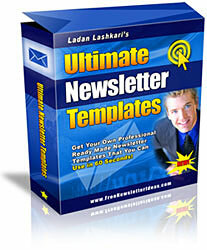 Ultimate Newsletter Templates With Resale Rights! It's all well and good sending out newsletters, but nobody will take you seriously if your newsletters look cheap and amateurish. This bonus item contains 26 professionally designed newsletter templates that will spice up your emails! 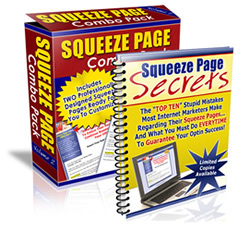 Squeeze Page Profit System With Resale & PLR Rights! This package comes with 2 modules. Module 1 provides you with a squeeze page combo pack containing professionally designed squeeze page templates. Module 2 contains a report showing you exactly how you turn your squeeze pages into powerful opt-in machines! Both modules also come with full PLR, and resale rights! This eBook looks at how people can become much more motivated. Becoming more motivated will help improve your lifestyle and increase your productivity. Moving to a new home abroad can be a daunting task. A lot of new movers are desperate for information on how to go about emigrating, this book will help them move to a new place in the sun! Article marketing is one of the cheapest, and easiest ways of promoting your website. 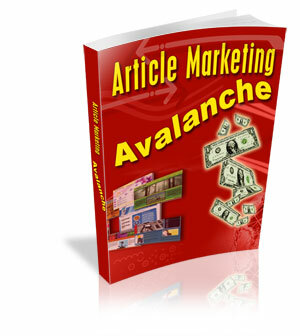 This book shows you the ins and outs of article marketing. This eBook shows you how you can change your fortunes around. It gives lots of ideas on how to become more productive and increase your online income. 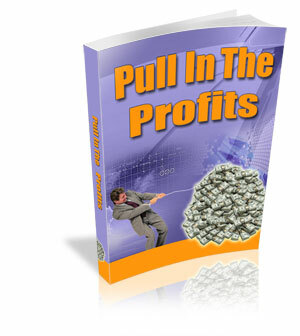 This eBook shows you how you can pull in the profits for your online business. The book looks in great detail at the different ways of making money online. Grab your Boomerang for only $47 Today, and get it out there as soon as you can, so it can start coming back with your mailing list too! I have known dan for a considerable time and always look forward to his new product launches. The standards that Dan sets his self are always of the highest that i have seen. This new peice of software called The Boomerang List Builder, is of that same highest standard that i have come to expect and takes list building to a whole new level, that anyone, and i do mean anyone, can easily use. to deliver to those willing and ready to register subscribers that will grow your list. 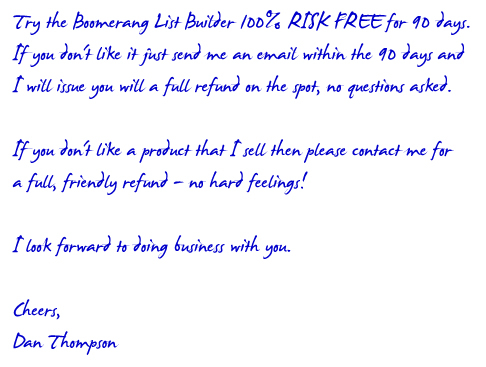 Remember that the Boomerang List Builder, is covered by my no quibble 90 day money back guarantee! No Questions Asked 90 Day Money back Guarantee! When you've built up a massive list of your own, please give me a shout when you're looking to promote anyones products and allow me the opportunity to JV with you.... thanks. P.S. 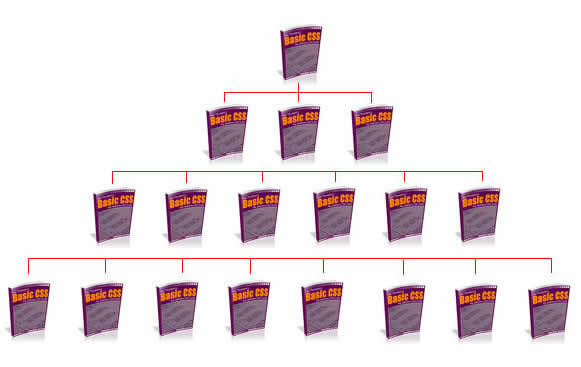 Did you download the free copy of Basic CSS?.... Keep it with my compliments, but do grab it to show you how easy the Boomerang comes back! P.P.S. Be sure to watch the video and see just how simply you'll be adding to your lists from now on.